If you want to clean messes in your home without getting out of bed, you need the best robotic vacuums for hardwood floors. There are dozens on the market, and picking the right one for you is really a matter of preference. Some robotic vacuums come with highly technological features, including voice integration with Bixby, Google, and Alexa. Other models offer less technology but an array of cleaning features. Here are a few things you should weigh in before buying though. A robotic vacuum is like any other piece of technology. You’ll either love it or hate it. Here are a few things to keep in mind if you want to love it. The first thing to check is the technology involved. What type of vacuum cleaner do you need? A simple robot designed to recognize its perimeter and perform a simple function with little intervention from your side, or a tech vacuum you can control remotely via an app or voice integration? If it’s the latter, expect to pay some more. The advantages are well worth it though. Depending on the size of your home, you may need a bigger or a smaller battery. Some of the best robotic vacuums have autonomy of over 100 minutes, and that’s the least you should aim for. Anything less than that would result in short and often ineffective cleaning cycles unless you live in a very small studio apartment. Last but not least, check the cleaning modes. Some robotic vacuums can only vacuum hard floors. Others can transition between floors and carpets. If you like to skip both vacuum and mopping, know that some models can even do both for you. A selection of three-in-one robotic vacuums can even offer dry sweep, wet, sweep and wet mopping capabilities, so you can smoothly transition from one mode to another. With this in mind, let’s now have a look at the best robotic vacuums for hardwood floors in 2019. Robotic vacuums are great for more than one reason, but perhaps the best robotic vacuum for hardwood floors is the ECOVACS DEEBOT N79S. The main feature of this exceptional product is the smart app and voice control integration with Google Home and Alexa. Through the app, you’ll be able to customize your vacuum, schedule and monitor cleaning sessions, receive error alerts, and monitor the accessory status. The N79S is not only smart; it’s also developed to provide a thorough cleaning of your floors. The three-stage cleaning system involves and anti-drop and anti-collision sensors that calculate the best route for your vacuum to cover most of your floor. With long battery life, this appliance works wonders in homes of most sizes. 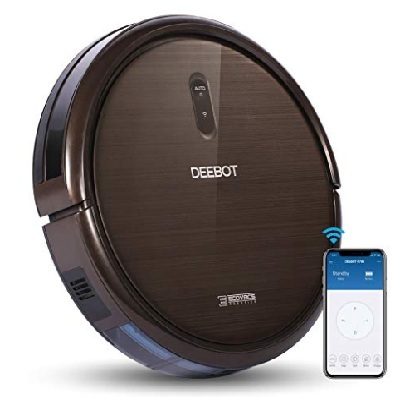 Smart, easy to control, and developed to clean your floors thoroughly, the DEEBOT N79S can bring all you could wish from a best in the class pick. The vacuum cleaner comes with a smart motion-guided auto-cleaning mode developed for a single room and targeted cleaning. An edge mode allows you to clean all areas of your floors, while the included accessories boost the product’s value even more. Samsung is one of those brands that has always been a pioneer in its field. This robotic vacuum is no exception and comes with plenty of innovative features that make it a great choice for those with a passion for tech. The unit comes with an onboard camera, advanced mapping systems, and a full view sensor developed to create the best cleaning path for all your environments. Your floors don’t consist of the easy-to-reach areas alone. Corners and edges also require attention if you want your home floors to shine. Thanks to the innovative technologies involved, the R7070 by Samsung can reach all corners and edges of the wall, so you can brag with perfectly cleaned hardwood floors whenever guests arrive. The Samsung R7070 may be expensive but is perhaps the best robotic vacuum for hardwood floors. Boasting a suction power 40 times more powerful than regular vacuums, the system can easily wipe away dirt, pet hair, and other messes from hardwood floors and not only. Fast cleaning speed, Bixby, Google Assistant, and Alexa integration, and easy to control from your smartphone; this is no doubt an excellent product to consider. Designated the best robot vacuum of the year in 2018 by Digital Trends, the eufy Boost IQ comes with a wealth of premium features that make it a smart choice for most homeowners. One of the greatest features is its slim design alongside the tempered glass top cover designed to give protection to the system. Furthermore, the unit has an infrared sensor that allows it to evade obstacles and drop-sensing technology to avoid falls. This robotic vacuum is designed to perform at high suction of 1300Pa for up to 100 minutes but thanks to the BoostIQ technology, the can increase its suction power automatically if it has to deal with big messes. This ensures the high performance you’d expect from such a tool. The eufy 11S is a high-performing vacuum ideal for those shopping on a budget. It’s controlled by remote control and powered by two AAA batteries. Its great power of up to 1300Pa and BoostIQ allow the unit to deal with most messes quickly and effortlessly. Twelve months of worry-free warranty and a bunch of premium features bring further value for money, making the robot a great choice for most homeowners. The Deenkee i7 is one of the most performing robotic vacuum cleaners for home use. It boasts a 3-in-1 function that allows it to work as a vacuum, mop, or sweeper capable of removing dirt, dust, pet hair, and larger debris from your hardwood and carpeted floors. Thanks to its self-charging capacity and powerful lithium-ion battery, the unit resists to up to 100-minute cleaning sessions at a time. Coming with smart touch and remote control, this robot vacuum is easy to operate by most homeowners. You can schedule the machine in an auto-cleaning mode and let it do everything else on its own. An infrared sensor allows the unit to detect and avoid obstacles, including the stairs, so it won’t fall down. Equipped with a powerful battery and packing all you need from a home robot cleaner, the Deenkee i7 comes with a host of advantages. You can use it to vacuum, sweep, or mop your hardwood floors, for overall peace of mind. The unit is capable of cleaning most messes, and it can even transition from hard floor to carpeted areas in the blink of an eye. All this combined with a great price brings true value for money. The last on our list but not for its importance, the iRobot jet 240 by Braava is perfect to use on all hard floors and is designed to go even into the hard-to-reach places, such as under a sofa or toilet. Its precision jet spray and vibrating cleaning head allow you to clean the entire house quickly, in either dry or wet cleaning mode. This robotic vacuum boasts three cleaning modes that make it perfect for most homeowners. It can pass from dry sweeping to wet sweeping or mopping based on your preference, and it is great to use on all hard surfaces including hardwood, stone, and tile. Small enough to go in the tightest spaces yet powerful enough to clean all messes, this robotic vacuum is another one that deserves your attention. It automatically selects the cleaning modes based on the type of cleaning pad you installed, and it can remove all messes from your hard floors in a quick, effortless passage. Robotic vacuums come as a great solution for all homeowners who want to clean their hardwood floor in all peace of mind. The most performing models are easy to control via apps and even come with voice integration systems. The more primitive models still work great and appeal to the less technological homeowners. Regardless of what model you need, you now even know which are some of the best robotic vacuums on the market in 2019.